Hardwood floors can be cleaned with the right type of mop. The best mops for hardwood floors can be found online and at your local department store. They will not leave residue or scratch the wood. Here are some of the best choices selected by reviewers that rated the product they purchased. This item has a replaceable cleaner cartridge that has a Greenguard formula and a trigger on the handle to easily operate. The Bona Kemi WM710013348 Hardwood Floor Spray Mop is a non toxic cleaner as it leaves no residue or streaking. It has an ergonomic design and a swivel head that allows you to reach in areas that the average mop would not reach. It is very lightweight at three pounds and it has a metal hanging hook that allows you to store away the mop easier. It has a durable and high quality microfiber mop head that allows you to wash and reuse. This item received 4 stars from more than 240 Amazon reviewers to make this among the best mops for hardwood floors. It costs about $40 online. 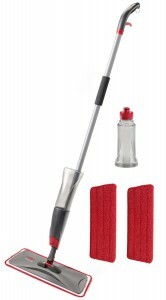 The Rubbermaid Reveal Spray Mop Kit FG1M1600 GRYRD is very lightweight at three pounds and comes with three microfiber wet mop pads that are washable and reusable. It also allows the floors to dry fast. It has an ergonomic handle and a durable mop kit. It can pick up to 50 percent more dirt than traditional sponge mops. You can reuse the mop heads up to 100 times after washings. It has a customize cleaning ability that allows you to choose wide and thick pads for heavy cleaning. It costs about $30 online and it earned 4 stars from 665 Amazon reviewers to bring this among the best mops for hardwood floors. This cleaner comes with a two year warranty at time of purchase. 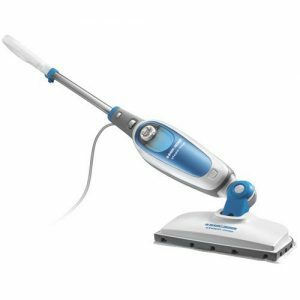 The Black and Decker SM 1620 Steam Mop with Smart Select Technology has a smart select dial that automatically releases the right amount of steam in accordance to the type of flooring you are cleaning. It has a swivel head that allows you to get into tight areas. There is a wide range of motion to reach larger areas. There is an illumination tank that runs from red to blue when it is ready to use and it takes about 15 seconds to start using. It has a water tank that is large and easy to fill and a hands free pad removal. There are three additional mop pads that come with this item that are reusable and washable. A 25 foot power cord allows you to reach further distances than other cleaners and it can kill up to 99.9 percent of bacteria and germs on the floor. All of these are among the top choices when searching for the best mops for hardwood floors. They all offer high quality cleaning and avoid scratches and residue left behind.